Twin Electric celebrates, post-victory. Third row, from left: Coach Brett Christensen, Coach Alicia Beckner, Coach Mark Brown Center row, from left: Brooke Mowatt (RF), Kennedy Beckner (C), Grace Wallace (P), Riley Campbell (3B), Coach Lisa Wallace Front row, from left: Emma Brown (RCF), Kolby Boulay (1B), Hannah Christensen (LF), Leah Noone (2B), Ava Anderson (SS), Macey Campbell (LCF) Photo courtesy of Lisa Wallace. 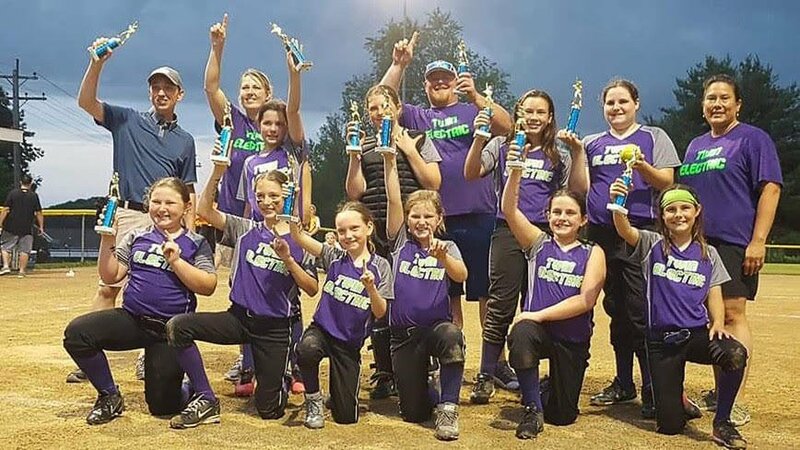 WESTBROOK – Westbrook Little League Softball closed out their season on Monday, June 19, with a championship battle between the Twin Electric and Extreme squads at Cornelia Warren Field. Twin Electric emerged victorious in the end, by a score of 10-3. The team finishes the spring at 10-2-1. Photo courtesy of Lisa Wallace.